The change is an expansion of the ACT's current reportable conduct scheme to include religious organisations' 'activities, facilities, programs or services' to report allegations, offences, or convictions related to children to the ACT Ombudsman. This expansion was supported by Archbishop Prowse, who had been calling for the reportable conduct scheme to include parishes and religious organisations for "well over a year." The new law comes into effect on 1 July, but the provision relating to the confessional won't apply until 31 March, 2019 to give Church authorities time to discuss with the Government how it will work. If no solution is found, the ACT will become the country's only jurisdiction where priests can be convicted for maintaining the seal of confession. "I'm extremely disappointed that [the bill] was augmented to include intervention into the sacrament of confession without any consultation with the archdiocese," Archbishop Prowse said. "I'm quite in shock about that. 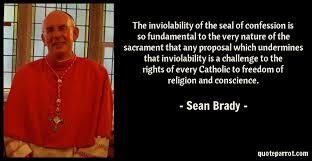 "To have the Church's sacramental life intruded upon is quite extraordinary given the democratic country we live in. "The way we are moving is towards a fundamental infringement on basic human rights of religious expression and freedom." "I immediately wrote to the Attorney General requesting a meeting which is scheduled for June 19. I was given minimal time to respond and I just found in the last week that it was going to be debated in parliament yesterday. "That meeting will now be pivotal because I still don't know what they've got in mind. "I believe that is it not an 'either-or' situation of ensuring child safety or the integrity of the sacrament. "It's 'both-and' child safety and the integrity of the sacrament. "All of us have got to work these areas out together in a respectful tone of mutual dialogue." The archbishop said he has been in touch with canon lawyers for advice on the issue and would also speak with the Apostolic Nuncio, Pope Francis' representative in Australia. In an opinion article for The Canberra Times today, Archbishop Prowse said the requirement to break the seal of confession would neither help to prevent abuse or efforts to improve the safety of children in Catholic institutions. Apart from the fact that child abusers do not confess their crimes, such legislation would also threaten Catholic's religious freedom and put it out of step with other jurisdictions, he wrote. "The government threatens religious freedom by appointing itself an expert on religious practices and by attempting to change the sacrament of confession while delivering no improvement in the safety of children. "Sadly, breaking the seal of confession won't prevent abuse and it won't help our ongoing efforts to improve the safety of children in Catholic institutions." He also argued it would be difficult to put into practice, as most confessions are done anonymously and there's no proof of identity required. Last year's Royal Commission recommendations included the creation of laws covering priests who fail to report abuse admissions made during confession. NSW Premier Gladys Berejiklian in April said her government's response to the Royal Commission recommendation was to "take it through the COAG process". "They're complex issues that need to be balanced with what people believe to be religious freedoms," she said.